Going big within own capacity! Size may matter but mostly, it is all about what one achieves in his or her life while residing in the defined boundaries. We all dream about going an extra mile to show the world what we are capable of. Breaking the barriers in case they are needed, we like to test ourselves to understand our values. But many in this world may not even dream about doing something extraordinary. They might just take the big leap to achieve what they desire. 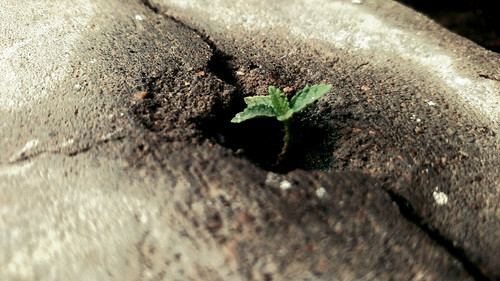 Like this tiny plant I saw couple of months ago, popping out through a small opening on a cemented floor. A remarkably big feat this little fella has accomplished to grab his share of sunlight and water. There’s no stopping to you if you want to go big. All you need is faith, courage and determination to show what you are capable of. This is my entry for Frank Jansen’s Tuesday Photo Challenge – Go Big! What a wonderful photo and thoughts for this theme Hammad. Thank you so very much, Miriam. I actually kept this little fella hidden in my photo archive on purpose, as I had that feeling that some one may, just may, thought of a theme related to something big. Thank you Hammad, it was a perfect choice. Hope you have a wonderful weekend too.